Please recommend a cheap violin for a first timer. Looking for a violin below $200. Hello. I'm a 22year old student that has always had an interest in playing the violin. My income is only $250 a week so I would need to buy a CHEAP violin to get started. Basically I just want a very traditional and classical sound for songs like Bach Air on G. Not an Irish sounding pub fiddle (not that there is anything wrong with that). I just want to get familiar with the fundamentals and traditional sound of each note. Next year I plan to move on to an electrical violin and mix up my style of play a little once the fundamentals have been absorbed to some extent. So knowing my budget, what brands should I look out for? I heard Yamaha makes good violins and pianos, that is basically all I know. Should I just ebay something for $50? I don't want my ear to learn the WRONG sound that is the most important part, if you get what I mean, if I absolutely have to or it is recommended I will spend up to $700. Edit: Should probably link an example of what I want it to sound similar to. Would absolutely love a SOFT sound, not whiney and sharp. Like the ladys violin in this video. http://www.youtube.com/watch?v.....KxpRfybe1U (you will understand from the first song). Is the instrument in the link perhaps a Viola? I don't know the difference between a Violin and Viola. But whatever has a softer sound is for me. Please excuse my confusion. buy from http://www.fiddlershop.com and you get reasonable prices, great service and no worries about the cheap ness. If you have a $700 budget you will be fine to find a good violin to start... some other websites would disagree... but Pierre can help you find something good...and so will the other members here. Good luck... Bach is yummy stuff. @irlwizard; Welcome to the forum. To begin, the lady in the video is playing a viola. They have a beautifull warm sound, several member's here have began playing viola also. 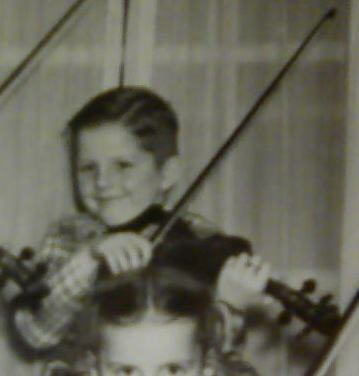 If you don't want a screechy sound, please stay away from the "Ebay" $ 50.00 violin, that's exactly what you'll get. 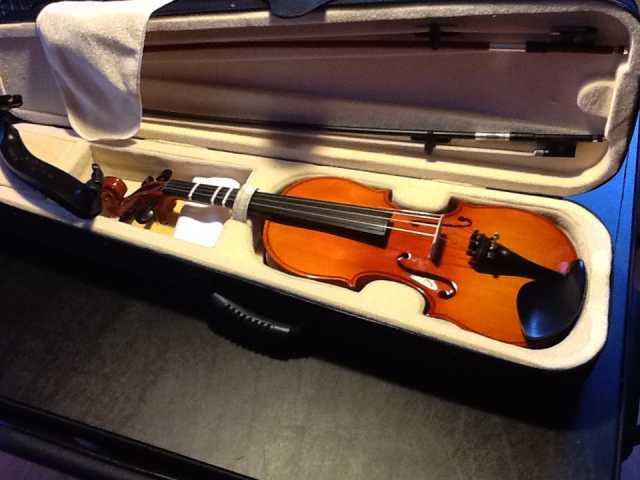 I'm thinking that you don't have to spend $ 700.00 on a violin, as pfish and coolpinkone pointed out, you can get a great sounding violin or viola from Fiddlerman / Fiddlershop for less money, unless you really want to spend that kind of money to start out. My suggestion as the other's have said, talk with Pierre, he will steer you in the right direction. Good luck with whatever you buy. Thanks a lot Fish, Pink and Ken for the warm welcome. But who is 'Pierre' (fiddlerman perhaps)? Where can I find him? Yep I like the sound of her viola more than a violin. Have never herd someone play a violin type instrument and make the Chello prelude sound like it was being played from a chello, like her. Violas are just a bit larger huh? Think this one will be able to match the sound produced in the video? Maybe after tuning? Edit: Is this a viola as well? If so it settles which instrument is for me. Pierre is the MASTER >> You will find him. You can find Pierre at http://www.fiddlershop.com . You can even call him on the phone, he's a real person who will even demonstrate a violin / violins for you. Adam, for some people cheap is $50 and for some, believe it or not, $2000 would be considered cheap. Now a days, thanks to the Chinese, although some will disagree, you can get a great instrument for the price that several have mentioned above. I like to start by asking your budget for a violin outfit (including bow rosin and case). You may need a shoulder-rest as well. Now a days, thanks to the Chinese, although some will disagree, you can get a great instrument for the price that several have mentioned above. You're totally right. I've had a few. I purchased the Cecilio CVN-300 from the fiddleshop for $129, got a shoulder rest new carbon fiber bow and Zyex strings all from the fiddlermans shop. i have only been playing for less than a week, but the violin sounds great when I play it right. The whole outfit cost just over $200. And have had great customer service. I can't add much here but my experience with these Ebay specials Fiddlestix mentioned I'm not going to go through the talking down of them as much as to tell you this for $50.00 you get an instrument with a case no strings no shoulder rest etc,even if these things come with the package deal their usual not suitable to be used or at least for me they weren't. Then on top of that depending where you live your $50.00 violin is going end up costing another $100+ to be set up properly in many cases when this is done in a music store with people who know their instruments in this case violin they will toss the bridge that came on the instrument the strings are usually of poor quality and need replacing as well. But with your budget as has already been mentioned you'll be fine had I have known what I know now my second violin would have come from Fiddlershop. Welcome to the forums good luck and I for one can't wait to see what you decide on. he will have great recommendation for you and you already found him! According to the title of the video for which you enquire about the instrument being played, in the title it states that it is a violin (but the title is normally hidden, so not everyone would notice). It looks to me like the violinist there (Sarah Chang) is mostly using the A & E strings. To hear a contrast, but also on a violin, here is a recording of another violinist who is instead using the G string. I gave up my fruitless search for a professional performance using the G string on a viola on Youtube. I don´t recommend cheap violins or violas. You might consider renting or borrowing a violin and a viola at the same time to begin with to see which fits you better, before buying anything. Yes I did and he has already recommended two violins and suggests that I would prefer a darker sounding one, which I think holds true. Will let you guys know what I end up with when a payment can be finalised. Donald I can't decide which version of the song I liked more but the 2nd rendition was a little bit boring. Maybe she just played it so slowly, however the violin sounded great. Hope I didn't offend anyone. Can admit that she is a better player than what I ever hope to become.